Our old mudroom wasn’t working for us. We had a big tall cubby unit for our kids to put their backpack and coats. However, the bins were way too high and out of reach for them to get anything themselves. We recently decided to do an overhaul and make our mudroom more functional and I absolutely love the transformation. Our mudroom is a high traffic area since we use it multiple times a day. It’s right off our garage so it’s how we get in and out of our home every day. Having a functional mudroom has made such a difference in teaching our kids to be more independent. They have their own side of the bench, with two baskets for their things and their own mat for shoes and boots. 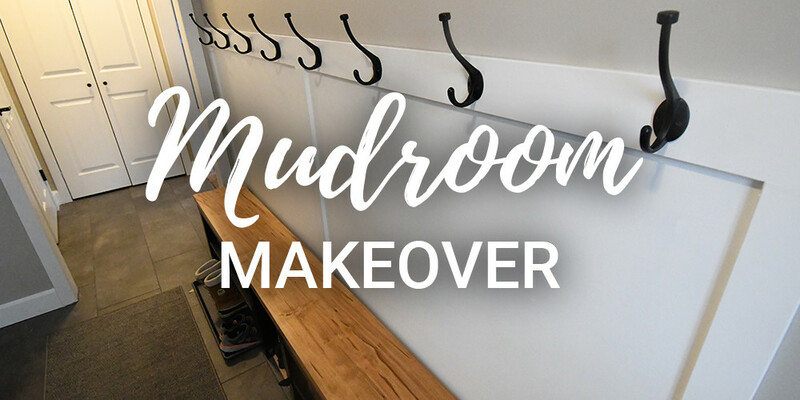 This mudroom makeover has helped to instill in them that there is a place for everything and it is their responsibility to make sure they put their belongings away each day. How is your mudroom or entry way working for you? It can be difficult depending on the space you have to work with. However, with a little creativity, I believe every challenge can be solved. Leave a comment below and share how you have made your mudroom a place where it can function well for your family.